We publish a newsletter that goes out a few times a year to customers who like to have a hard copy in their hands instead of reading the news on a computer screen. This way, it can be read at your leisure, away from your computer. We've just decided to make this newsletter available to everyone on the website as well! This newsletter has timely information about glass etching topics and new products that EtchMaster(R) is carrying to make your glass etching easier and more profitable. There are also notices of specials and limited time sales. The best thing is that you can print out this newsletter on your own color printer to get the full color version. To get this news letter, just visit this page for the most current version and click on the Download link (see below) for the version you want. Depending on how many pages in the newsletter and whether you have a high speed connection, it may take a couple of minutes to download the whole thing - so be patient! Once you have completed the download, save the newsletter to your desktop or another convenient place so you will know where it is when you would like to print it out. Important note: The newsletter is in PDF format, so you will need the Adobe Reader on your computer to read it. This software has come standard on most computers for years, but if you don't have it, you can get a free download from the Adobe website. When you click on one of the links below, a new window will open. While you download the newsletter, you can continue to browse our site. 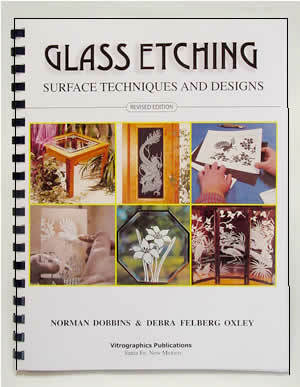 Brand new, revised edition of our book on surface etching techniques! New patterns, instructions - don't miss it! New EtchMaster(R) hardwood doors for your etched glass! The same high quality doors that are commercially available with beveled glass inserts can now be shipped direct to your studio, for your etched glass panels!